When I planned to have magical fantasy unicorn photo sessions in Atlanta Georgia, I'd never imagined it would be as adorable as this! The rainbow dress and gold star princess crown on this little blonde girl is beautiful in the backlit woods and forests of North GA.
Each child that has her photos done with this whimsical unicorn has a wonderful time hugging her, kissing her, walking her, and giggling with her. As a photographer, watching these moments is SO CUTE! The unicorn's soft white fur and little delicate horn pairs perfectly with the couture girls dresses and princess crowns. The tiny flowers around her neck and her dainty little horse hooves are also covered in glitter and sparkle in the sun. Little girls can gently braid her mane while whispering secrets into her soft ears. These dreamy portrait appointments are the best of the southeast and are sold out quickly every year! 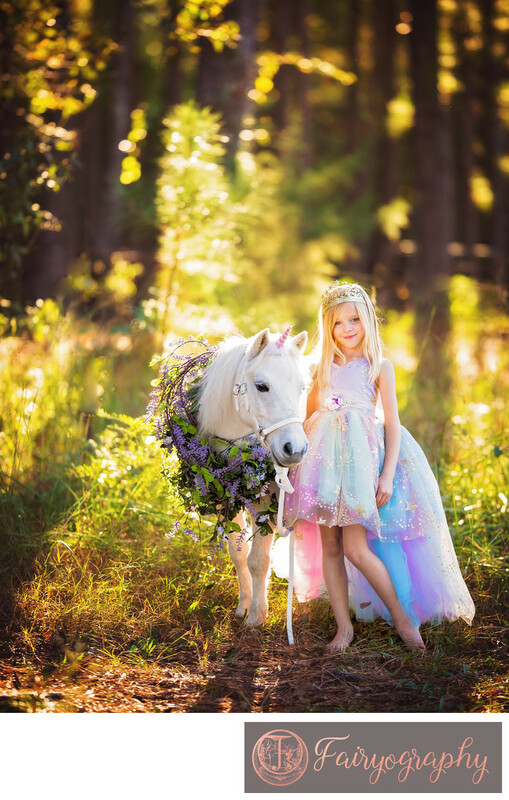 What I love most about these fantastic fairytale photo sessions is that the unicorn is totally safe for children. She's actually trained like a dog! She knows how to stand, to walk, to stop on command. Her little ears perk right up for treats too. She's kind and loves girls from toddlers and kids all the way to teenagers. The location in Watkinsville GA is a plant nursery, so they have some of the most gorgeous lawn and trees available around. The lighting there is perfect for pictures too, softly filtered through the leaves. Backlighting is gorgeous for this image! The rainbow dress I picked for this girl was a high-low dress so she wouldn't trip over it while playing, and the gold stars on the dress go wonderfully with the gold star crown on her little head. Location: Piccadilly Farms, Watkinsville, GA.
1/500; f/1.8; ISO 320; 135.0 mm.